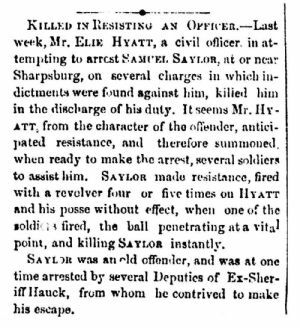 Killed in Resisting an Officer.—Last week, Mr. Elie Hyatt, a civil officer in attempting to arrest Samuel Saylor, at or near Sharpsburg, on several charges in which indictments were found against him, killed him in the discharge of his duty. It seems Mr. Hyatt, from the character of the offender, anticipated resistance, and therefore summoned, when ready to make the arrest, several soldiers to assist him. Saylor made resistance, fired with a revolver four or five times on Hyatt and his posse without effect, when one of the soldiers fired, the ball penetrating at a vital point, and killing Saylor instantly. Saylor was an old offender, and was at one time arrested by several Deputies of Ex-Sheriff Hauck, from whom he contrived to make his escape.